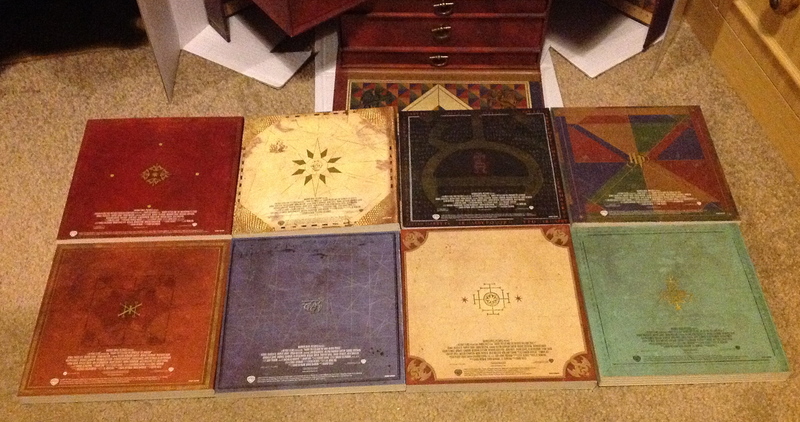 Today’s post is about the two books that are included in this set. They are the Label Collection and Catalogue of Artefacts. This is a blue softback book with gold writing. 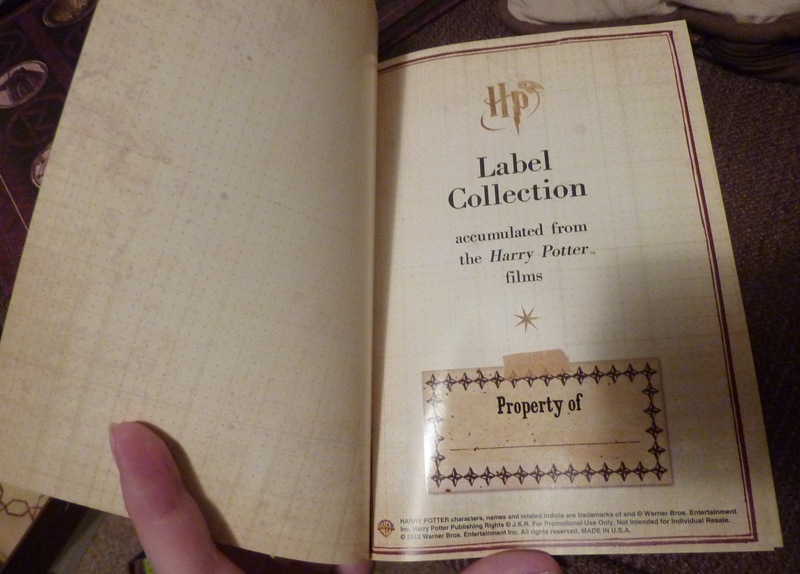 It isn’t a sticker collection but a book of labels collected from across the films presented on shiny paper. So, do I write my name inside the front cover? The level of detail of these labels to me just demonstrates the immense effort the production team put into creating the world. 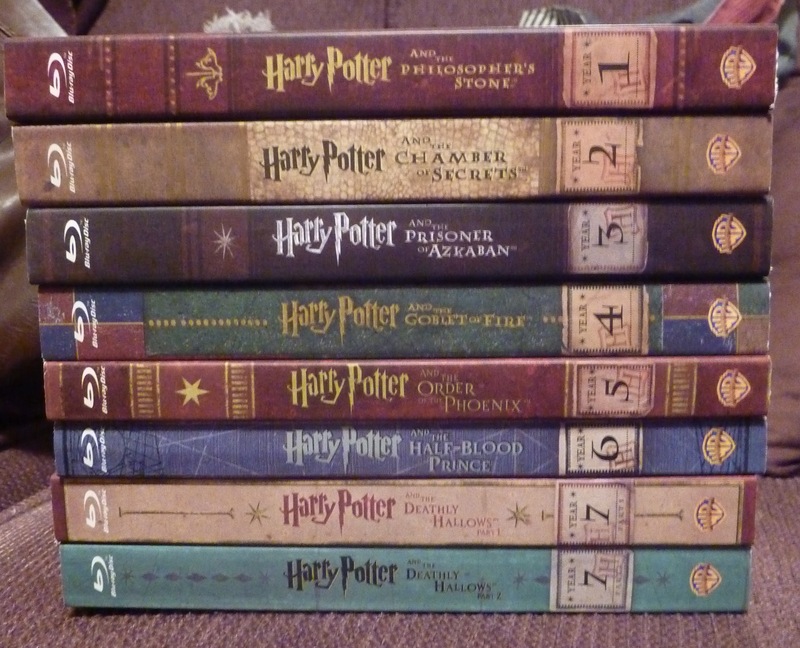 Many of these we wouldn’t have spotted whilst watching the films but I’m going to give it a go now. 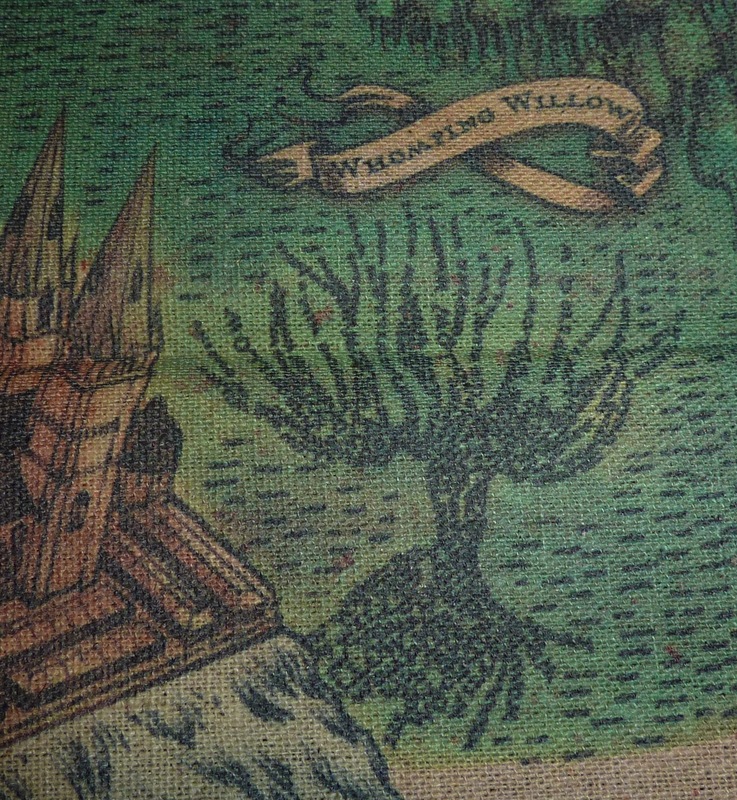 There are labels of things I think that are only referred to in the books and not just the films and I’m guessing many they just made up themselves. I’ve chosen to show you Essence of Dittany (useful in cases of Splinching) and the Decoy Detonator. 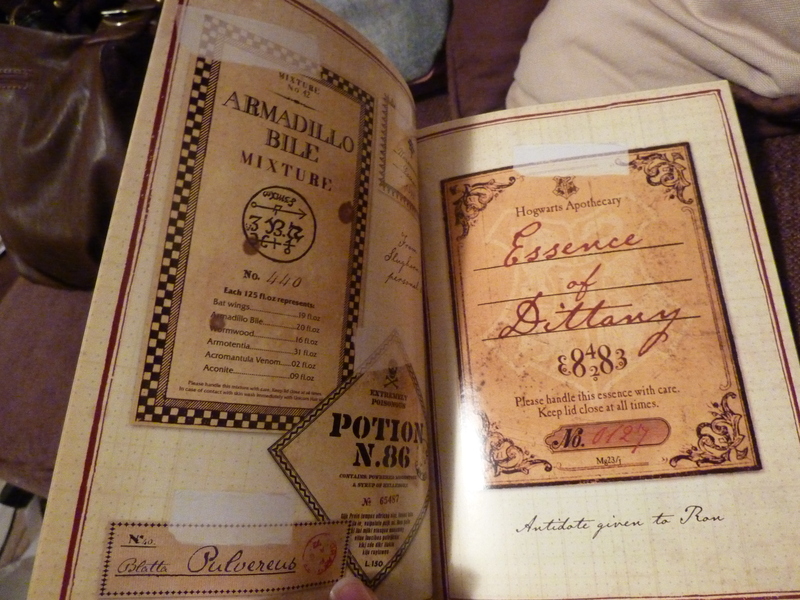 There are, however, potions labels, ingredients, Honeydukes products, Weasley’s Wizard Wheezes products, Labels from Dumbledore’s memory vials and more – outlined page by page below. Pages 8 and 9 – Honeydukes products – Pumpkin Juice, Fiery Black Pepper Imps, Honeydukes, Fizzing Whizzbees. Page 21 – YU’M*YU’M authentic Chinese Take-Away from the Quidditch World Cup, McGonagall’s dance class record label Spell-O-Fonix Wizard Waltz, Stills film roll from the Daily Prophet. 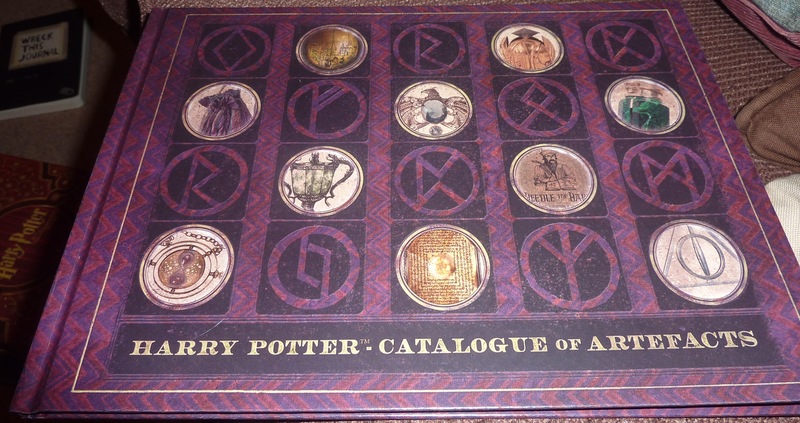 This Burgundy/Brown hardback book has 5 vertical rows of 4 symbols on the front cover – alternating runes and images within the circles – images are of hermione’s bag, time-turner, ? 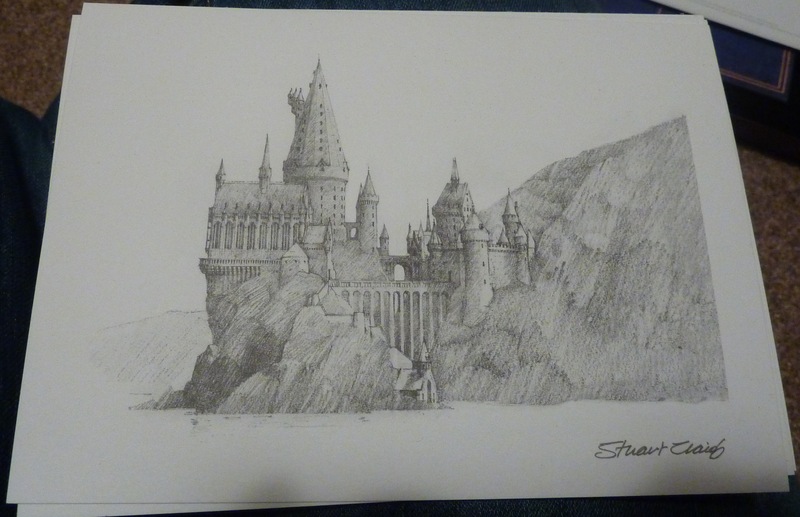 Castle, Triwizard Cup, Ravenclaw’s Diadem, (?) 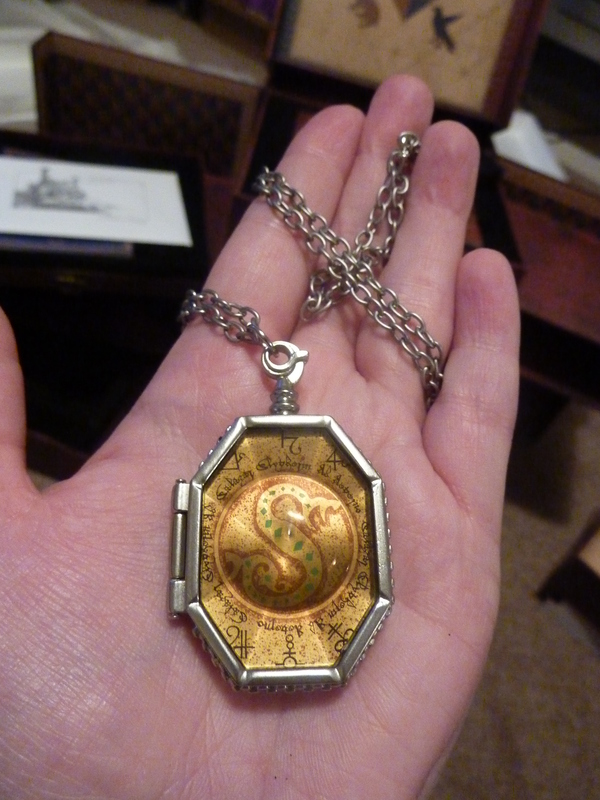 locket, Snitch, Beedle the Bard label, Deluminator and Deathly Hallows necklace. The Back cover has a gold H outlined on it. 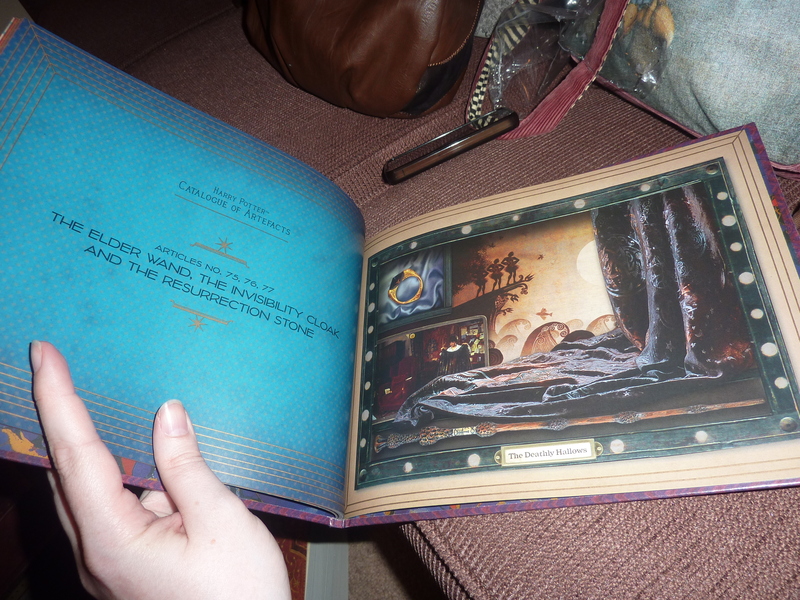 The Inside covers are marbled in red, gold, blue and purply on a dark blue background. Then inside again is a green hexagon patterned page. Like the Labels Collection this demonstrates the skill of the props/artefacts team. Pages 2/3 – Harry Potter – [Yellow left hand page] Hogwarts Express Ticket (Platform 9 3/4), Hogwarts acceptance letter envelope, Hogwarts Express Luggage Label, Harry’s wand and glasses, Chocolate frog box. 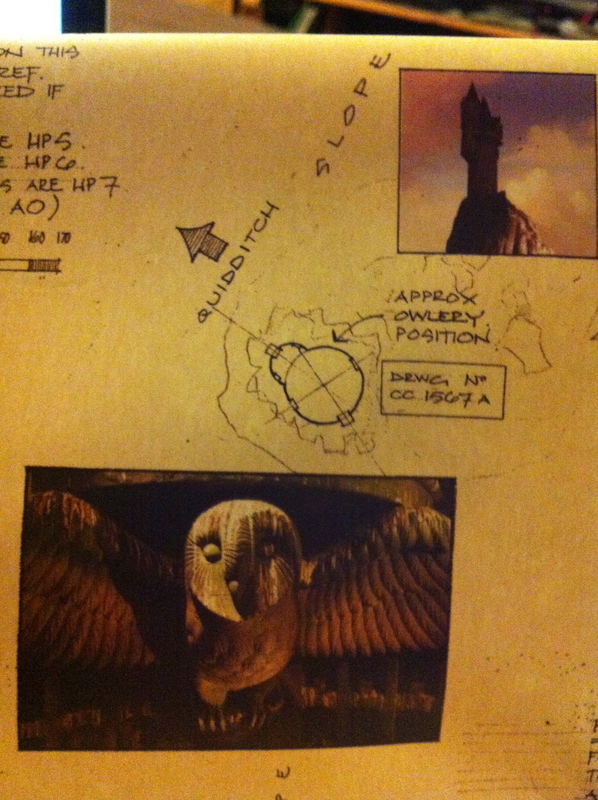 Also images of Harry with Hedwig on his arm and Harry in front of the Hogwarts Express. 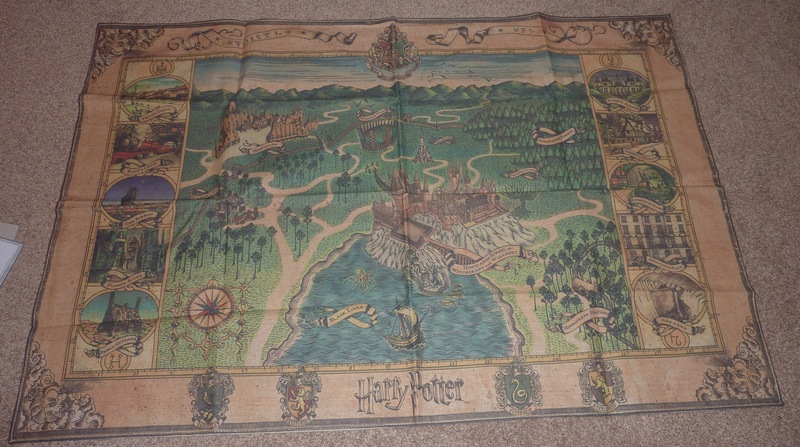 Pages 4/5 – Ronald Weasley [Bright Green left hand page] – Ron’s Wand, The Howler, Chudley Cannons Stickers and images of Fred, George, Ginny and Ron, Chudley Cannons bedspread and Scabbers. 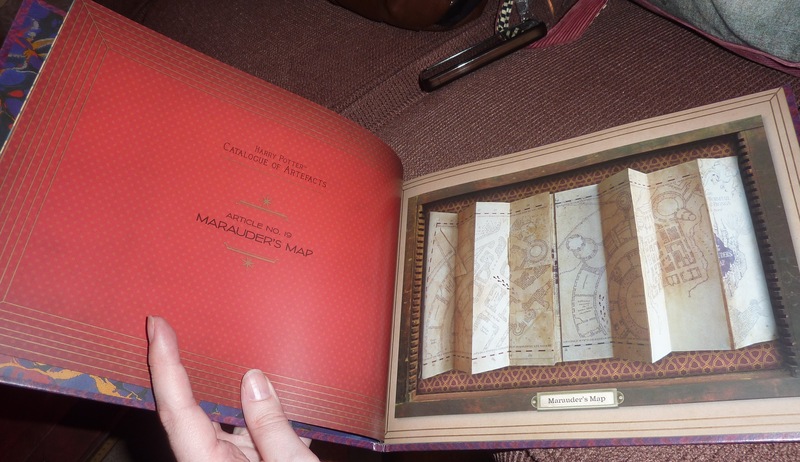 Pages 6/7 – Hermione Granger [Pink left hand page] – Yule Ball invitation, Time-Turner and Hermione’s wand. Images of Hermione with Crookshanks and Hermione and Harry in the hospital wing with the time-turner. Pages 8/9 – Gryffindor Common Room [Red left hand page] – Hogwarts School Exercise Books and Gryffindor Uniform Crest. Images of Ron on the sofa and Harry and Hermione on the floor in front of him and an empty common room showing the stairs to the dorm. Pages 10/11 – Gilderoy Lockhart [Yellow left hand page] – Books and Framed and autographed photos inc Guide to Household Pests, The Travel Trilogy Voyages with Vampires, also spines of VwV, Wanderings with Werewolves and Holidays with Hags, Arabia type pic, on a broomstick near a pink envelope, in blue robes – also his Defence Against the Dark Arts Second Year Essential Knowledge Test (all about him). 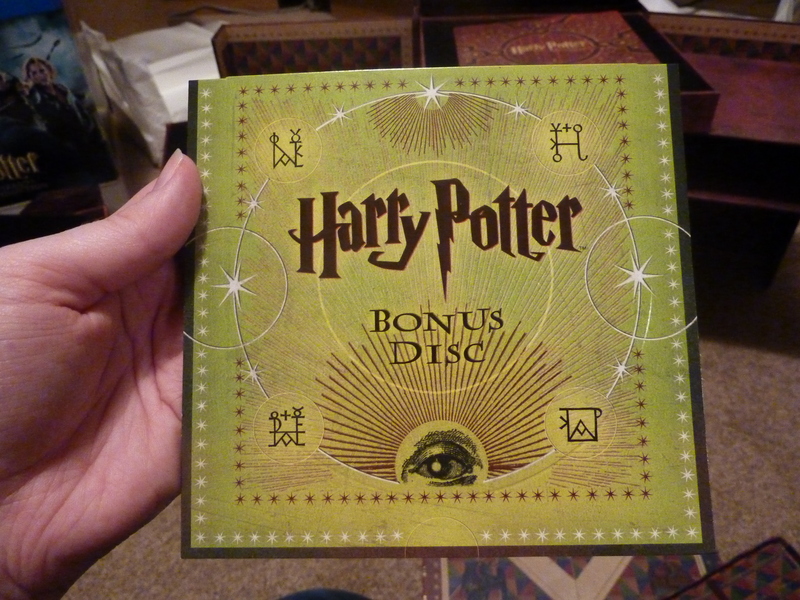 Pages 12/13 – Chamber of Secrets [Dull Bluey-Green left hand page] – Tom Riddle’s Diary with hole and Basilisk Fang. 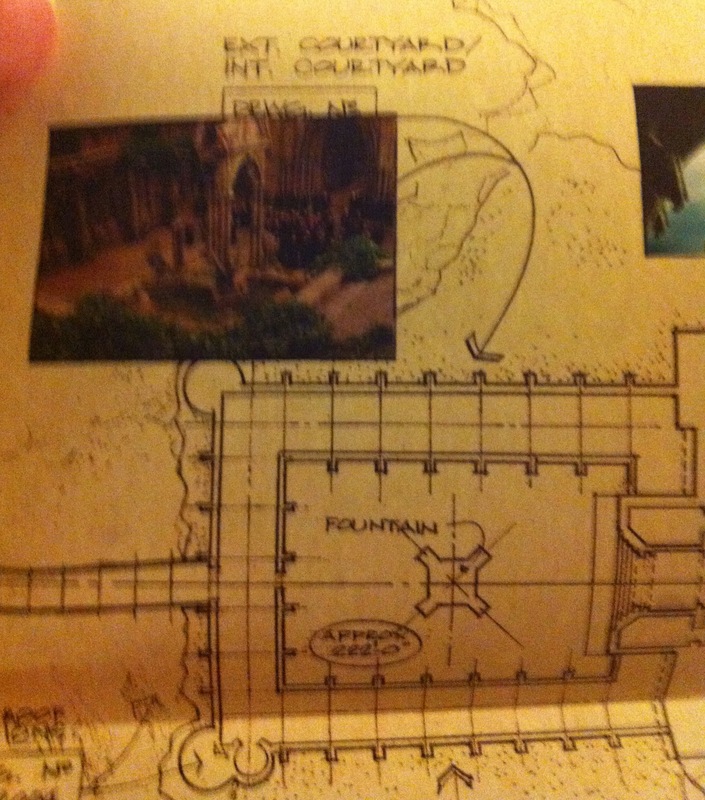 Images of the Slytherin Statue from the Chamber and Harry reading the diary in the common room. Pages 16/17 – Honeydukes [Aqua-Blue left hand page] – Cauldron Cakes, Fizzing Whizzbees, Pumpkin Juice, Bertie Bott’s Every Flavour Beans, Honeydues striped bags and Exploding Bon Bons (Full packaging including labels). Pages 18/19 – Quiddith World Cup [Bright Green left hand page] – Programme, The Final Ticket, Ireland and Bulgaria flags, poster and Krum Merchandise (outfit). Image of the stadium from above. 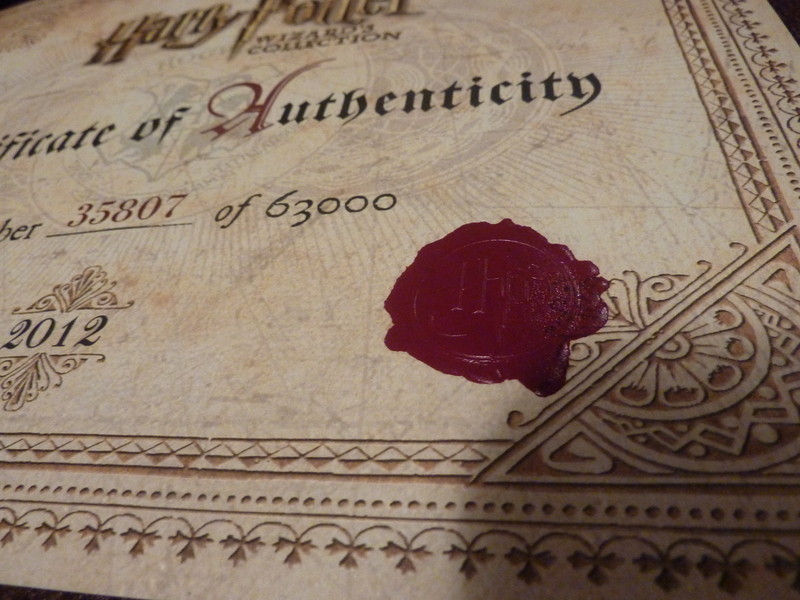 Pages 20/21 – [Yellow left hand page] – Triwizard Tournament – Triwizard Cup, Book – Triwizard Tragedies, The Golden Egg (open) and Competitior’s Entry Papers. Image of Harry looking at the open Golden Egg. Pages 22/23 – Dolores Umbridge [Pink left hand page] – Cat Plate, Cat stationery with letter to Minerva about Harry’s poor behaviour in class, ?Cat Pen, Cat Pin, Proclamation Educational Decree No 119, Progress Report Magical Didactics, Framed (Ministry M frame) of Dolores at her desk tea cup in hand, cat plates behind, O.W.L exam paper. Pages 24/25 – Potions Class [Dull Bluey-Green left hand page] – Advanced Potions Making Books, older and newer versions also inner page saying property of the Half-Blood Prince, Bezoar Box, A Cauldron, Potions Bottles (N.86, sleeping draught, 73, 74 and two others I can’t read). 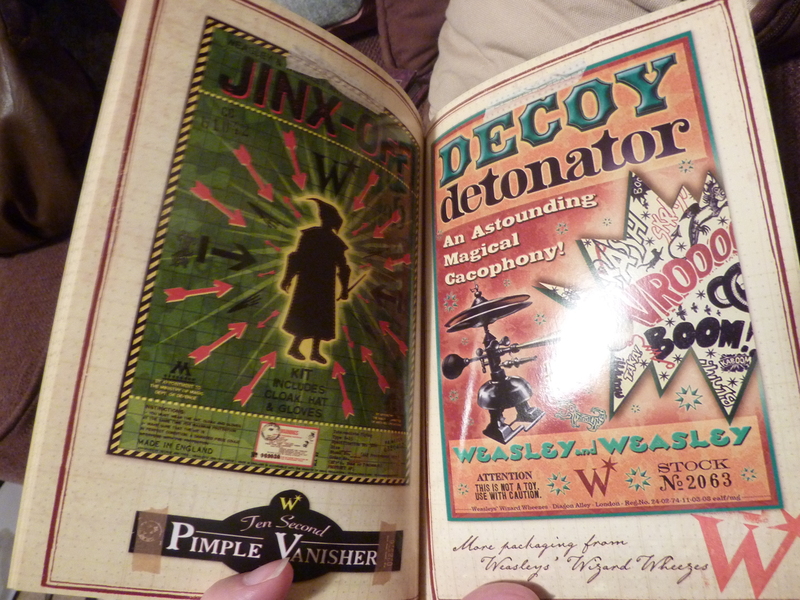 Pages 26/27 – Weasley’s Wizard Wheezes [Bright Green left hand page] – nose Biting Teacup, Skiving Snackbox poster, unlucky dip, Screaming Yo-Yo, Fanged Flyer (green snake-like frisbee), Electric Shock Shake, Stock list, receipt, Boxing Telescope, decoy Detonator, Price List, Badges. 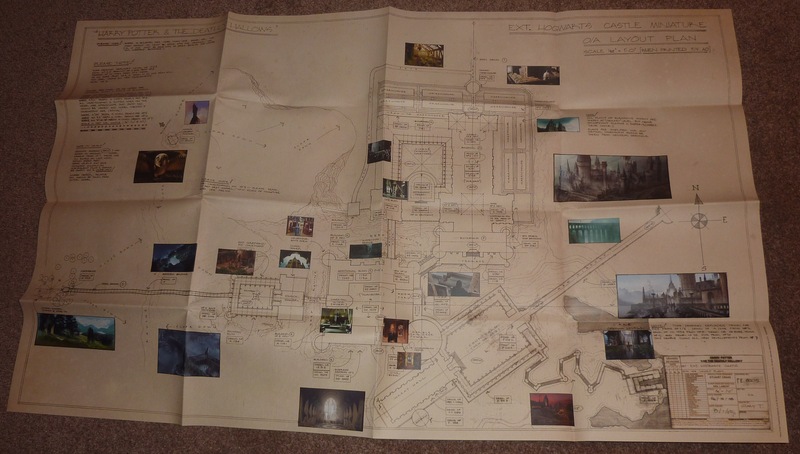 Pages 28/29 – Dumbledore’s Office [Yellow left hand page] – Memory Vial Thomas Riddle 1938, Image of Gambon’s Dumbledore next to Memory Cabinet with a vial in his hand. Astrolabe, Red Fawkes Feather, Image of Harry on the Griffen staircase. Pages 30/31 – Ministry of Magic [Purple left hand page] – Image of Fudge, Minster for Magic Cornelius Fudge’s Chain of Office, Ministry of Magic purple flying memos, Visitor’s Badge No 09018, I.D. Card (purrple front with image of Ray Cattermole inside) , Mudloods and the Dangers handout, Muggle-Born Registration Comission Order No 902-MBRC/ and Rolled The Daily Prophet (weather and zodiac). 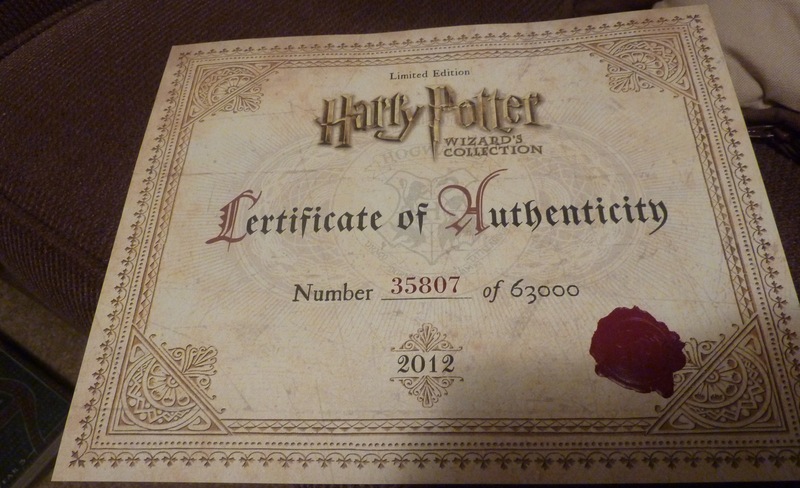 Pages 32/33 – Hall of Prophecy [Red left hand page] – Prophecies (97.129 [Harry’s] , 97.130 and 97.131) and Voldemort’s Wand. 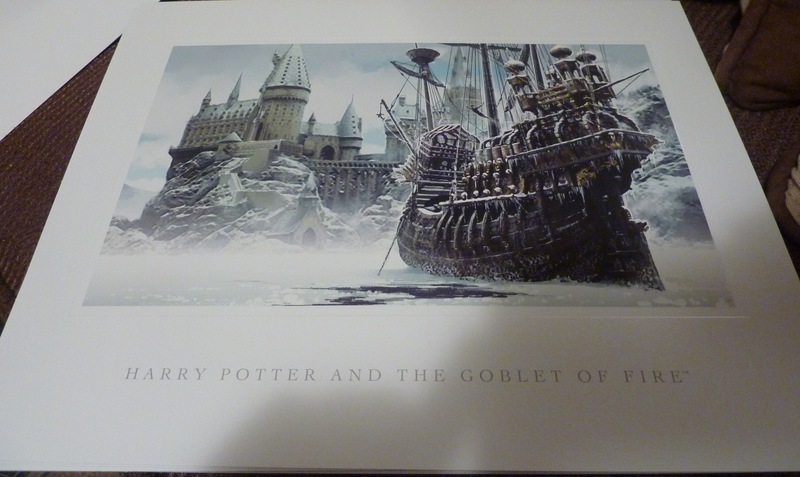 Images of Harry’s Propehcy Ball and Harry, Ginny, Neville and Luna in the Hall of Prophecy. Pages 34/35 – Death Eaters [Dull Bluey-Green left hand page] – Three Different Death Eater Masks. 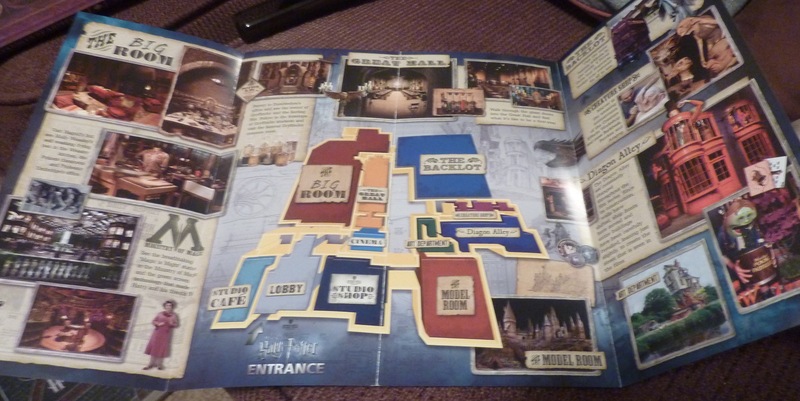 Pages 36/37 – Gringotts Bank [Yellow left hand page] – Gringott’s Bank Ledger, Gold Inkkwell, Bellatrix’s Jewels. Wizard Money (bronze knut, silver sickle, golden galleon), possibly a withdrawal/credit slip, Golden skull, Hand clutching a crystal ball with rings and bracelets. Images of Goblins stood under chandelier, Harry in Bellatrix’s vault on the growing mound of treasure, The dragon bursting from the room. 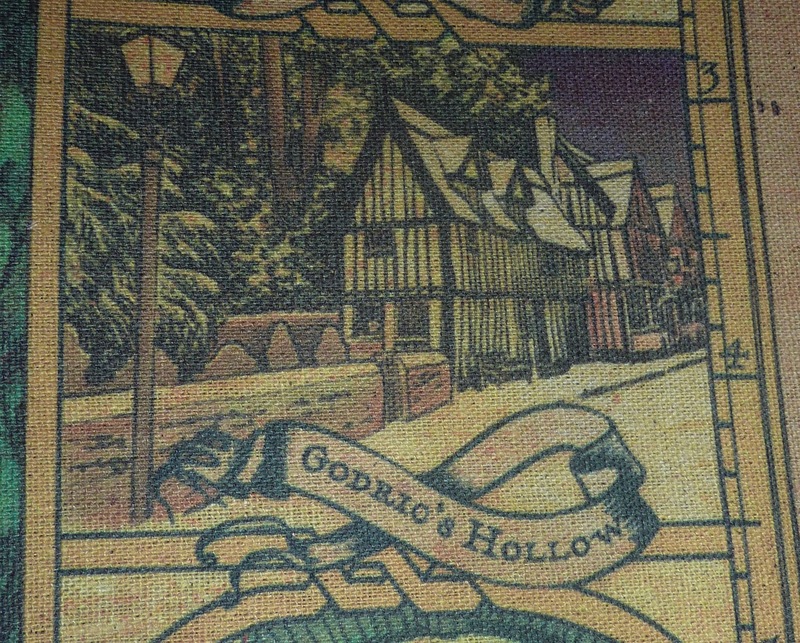 Pages 38/39 – Deathly Hallows Necklace [Aqua-Blue left hand page] – Background image of the Lovegood’s house with an Image of the Trio with Xenophilius Lovegood drawing the Hallows symbol. 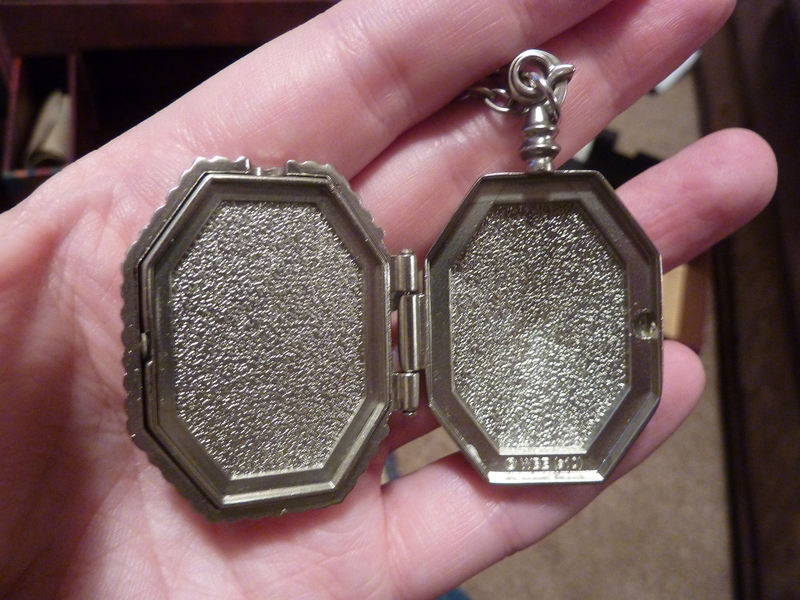 The symbol drawing on Tales of Beedle the Bard and the necklace and a sketch of the necklace. Pages 40/41 – Dumbledore’s WIll [Dull Bluey-Green left hand page] – Dumbledore’s WIll, His copy of Tales of Beedle the Bard, The Golden Snitch (open to show the ring) and the Deluminator. Pages 42/43 – Hermione Granger’s Bag [Pink left hand page] – Image of Harry and Hermione dancing in the tent, Image of the tent from outside, Hermione’s bag in the middle, Essence of Dittany Bottle, Rita Skeeter’s Albus Dumbledore book, Advanced Rune Translation, two other books, one looks like it could be called Healing Magic. 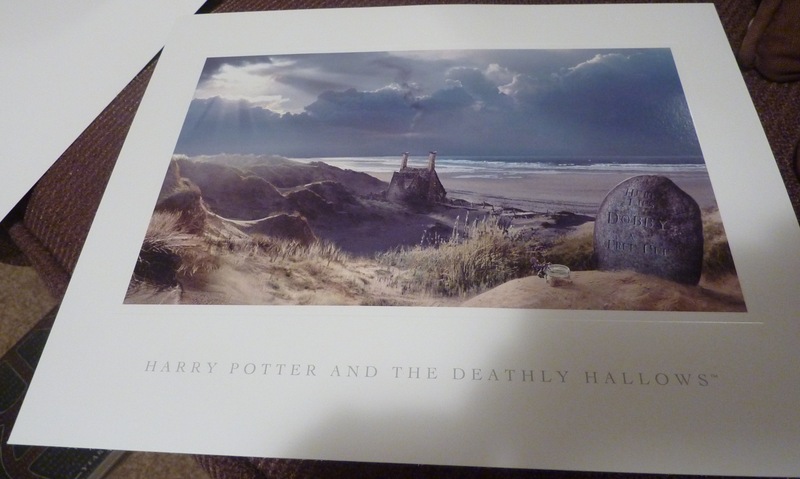 Pages 44/45 – The Deathly Hallows [Aqua-Blue left hand page] – The Elder Wand, The Resurrection Stone Ring and the Invisibility Cloak (I love the material of this when seen at the studio tour and in the image I’ll show you below). Image of the Three brothers cartoon from the film and of Harry holding the Invisibility Cloak in Year 1. 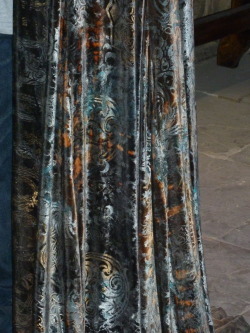 Here is the snap I took of the cloak material at the Studio Tour too. 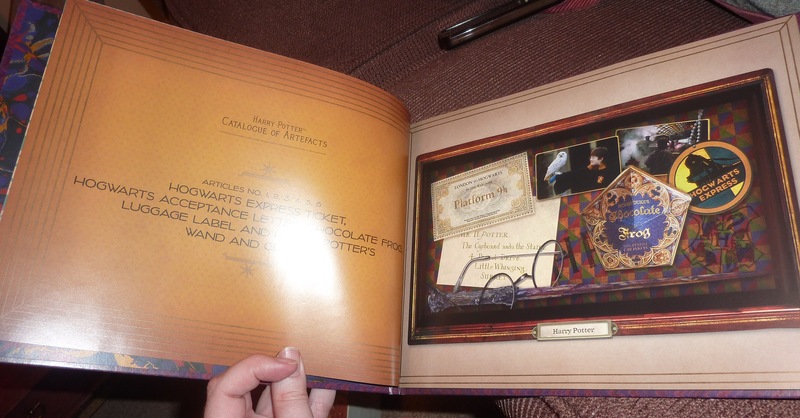 Pages 46/47 – Horcruxes [Yellow left hand page] – Salazar Slytherin’s Locket, Rowena Ravenclaw’s Diadem and Helga Hufflepuff’s Cup each with a drawing of the item too. Page 48 Pink left hand page with Article No 81 The Sorting Hat being placed on Harry’s Head.